MagazineAutumn 2013: Future challenges: is the UN equipped to meet them? The Universal Declaration of Human Rights (UDHR) has helped establish a legal framework and culture of respect for human rights that has influenced relations between individuals, groups and governments worldwide. There are few that would deny the universality of these principles, yet putting them into practice challenges us continuously. In 1948, it would have been difficult to imagine that by 2030, there would be more people over the age of 60 than children under 10. This unprecedented demographic shift reflects successes in reducing poverty and medical advances leading to much greater longevity, as well as decreasing birth rates. Older people are also able to make substantial contributions to their families, communities and the economy for much longer than was the case in the past. With increased longevity, however, come new challenges: age discrimination, age-related diseases and dementia, poor health and social care, lack of financial and physical security, isolation, and increased frailty and vulnerability. Given that soon 20 per cent of the world’s population will be over the age of 60, we need to put in the work now to make sure that our human rights protection is fit for purpose. However, this is where the wisdom of the drafters of the UDHR fell short. The Declaration and almost all subsequent human rights treaties simply do not recognise the specific experience of ageing. Older people’s concerns tend to fall under the catch-all “other status” category. This means that there is no global legal mandate not to discriminate on the basis of age; in practice, the human rights protections that should apply to people at all stages of their life are often forgotten where older people are concerned. So what can be done? The international human rights system has evolved greatly since 1948 as UN member states have adopted conventions on the rights of women, children and people living with disabilities. These have made a huge impact on the lives of millions of people by providing greater clarity as to what human rights mean for specific groups, establishing global legal standards and providing a framework for more effective engagement between citizens and their governments. This experience has shown us that a convention is the best proven method for establishing universal legally binding human rights protection. But the path to a convention is a long one and involves a process rather than a single decision. To have any resonance and force, a convention must be agreed and ratified by the largest number of member states, but it only really becomes meaningful when implemented at the national level. The process also requires the active involvement of civil society and older people themselves. This is essential for three reasons: 1) governments will not make a convention a political priority unless they think this is what their population wants; 2) the content of a convention must be informed by the day-to-day lived realities of older people; and 3) ensuring a global standard is implemented on a national level requires engagement between civil society and their governments. It is encouraging, then, that the UN General Assembly set up an Open-ended Working Group on Ageing (OEWG) for the purpose of strengthening the protection of the rights of older persons. This provides a unique forum for governments and civil society as we collectively seek to address the issues that arise from an ageing global population. The fourth meeting of the OEWG took place in August and it is clear that all participating member states agree something must be done. There are great divisions within the room, however, as to whether a new convention is the solution or whether we simply need to use what instruments we have more effectively. Given that the process depends on building consensus among member states, each of which has its own national interests in mind, it can be difficult to know how far we are on the path towards a convention. The process though has built greater understanding of the problem, which will, it is to be hoped, result in better policies. Protecting the rights of older people, however, does not mean simply waiting for a final decision on a convention. We must use every mechanism and tool available to build awareness and improve implementation of existing human rights standards while looking to the future. The lives of older people literally depend on it. © UN Photo/Hanns Maier. 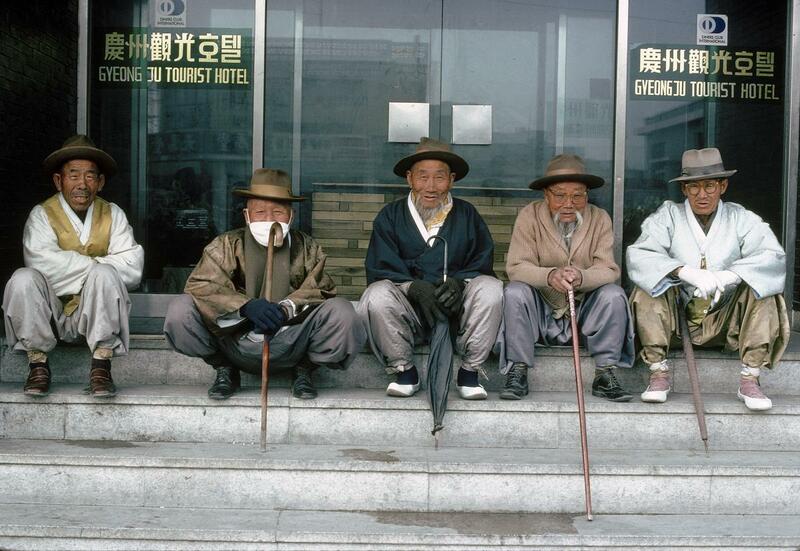 A group of elderly persons in Gueong-Ju, South Korea.